Burke senior Levar Williams will put his shooting skills on display in the Boston City League All-Star games at Northeastern’s Cabot Center Saturday afternoon. 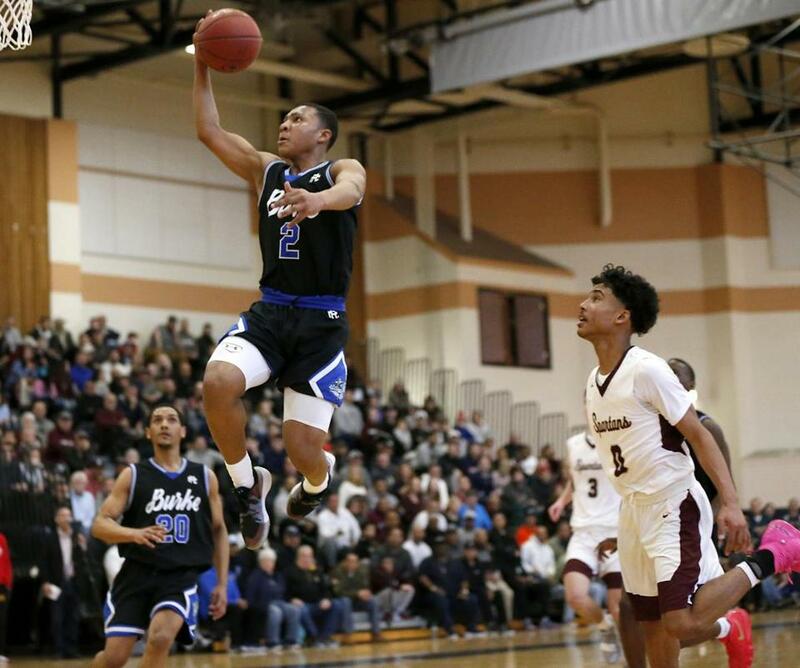 The 2018-19 MIAA basketball season has come to an end, but the best players in the Boston City League will lace up their sneakers one more time in the Dr. Joseph Warren BPS/SA Girls’ and Boys’ Basketball All-Star Classic Saturday at Northeastern’s Cabot Center. The event includes live music, a raffle with fan giveaways, a BCL all-star cheerleader performance, and a speech from Newton mayor Setti Warren. The girls’ all-star teams face off at noon, with Fenway coach John Rice and Boston Latin Academy coach William Dever each guiding a team. The boys’ all-star teams tip off at 2 p.m. with TechBoston coach Johnny Williams steering his side in a rivalry clash against New Mission coach Malcolm Smith, three of his New Mission players, and Burke’s elite backcourt of Levar Williams and Devante Jamison. Williams is a favorite to win the boys’ 3-point contest. Three-point contests will be held at halftime of both all-star games. The 2018 BCL Basketball Sportsmanship Awards will be also be handed out during halftime. The Massachusetts High School Football Coaches Association will hold its annual awards dinner on Sunday, April 28, at the Hilton Doubletree in Westborough. Social hour begins at 4 p.m., followed by the dinner at 5. For ticket information please contact Sandy Ruggles (sandyruggles@hotmail.com) or Tom Lopez (LSFootball@aol.com). Six head coaches will be inducted into the MHSFCA Hall of Fame: Greg Burke (Stoughton); Serge Clivio (Arlington Catholic); Jim Duggan (Maynard); Ed Guadian (Newburyport); Tim Morris (Melrose); Mike Redding (Mansfield). Six assistants will also be honored: Mike Cella (Pope John); Dave Swanton (Hopkinton); Mike Bordieri (Foxborough); Dave Bunton (Buckingham, Browne & Nichols), Bill Pacitto (Cardinal Spellman); and Mike Eakins (Braintree). Rick Moore & Bill Newell (Msonewsports) will receive media awards, along with Danny Ventura (Boston Herald). Lopez, who retired in December after 41 seasons at Lincoln-Sudbury Regional, will receive special recognition for becoming the fifth coach in state history to record 300 career wins. Nine players will also be recognized with the “Courageous Player” awards. All battled through adversity to contribute to their teams this season. The honorees: Robert Martins (Braintree); Cory Bright (Bishop Fenwick); Dante Sequeira (Ayer-Shirley); Kenneth Rezendes (Matignon); Manan Patel (Northeast Metro); Anestasia Bessler (Mystic Valley); Peter Roche (Arlington); Nick Scire (Stoneham); Brent Dixon (Apponequet). Mike Deady stepped down as varsity girls’ basketball coach at Bishop Feehan Monday after a 22-year run, punctuated by a 355-99 record and a Division 1 state title in 2016. A number of his players have gone on to play in college, headlined by Missy Traversi (Maine), Laura Lokitis (Boston College), Amy Lepley (Holy Cross), Lexi Sells (Providence), Sierra Schrader (Adelphi), Lauren Manis (Holy Cross) and Katie Nelson (Boston University) and Maddie Jolin (Providence College). The Globe’s 2018-19 Winter All-Scholastic section will be published on Sunday, April 7. League and conference reps are asked to email their all-star teams to hssports@globe.com andcraig.larson@globe.com ASAP.